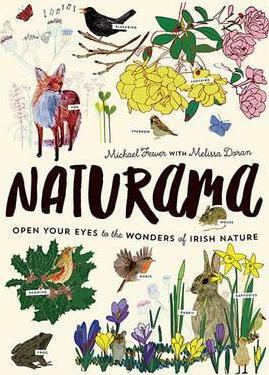 This breathtakingly exciting new book introduces you to Ireland's flora and fauna with every changing season. Discover the magic of nature right on your doorstep, from the back garden to the local park and the countryside. Even the smallest garden is a vast canvas of nature with its worms, insects, flowers and birds. Listen to the blackbird's song, spot an madra rua in your local town, discover why the ash tree is good for making hurlies, count a snail's 27,000 teeth, watch stags fight and spot jellyfish at the seaside, laughing as you discover the meaning of their Irish name, smugairle roin! With Naturama you will discover the magic of every Irish season. So put your boots on - it's time to go outside! Michael Fewer is an architect, environmentalist and writer. He has published work over the last twenty-five years on subjects varying from architectural history and travel to walking and nature guides. Previous books include Day Tours from Dublin, By Swerve of Shore, Irish Waterside Walks, The Way-Marked Trails of Ireland, Irish Long Distance Walks, all published by Gill Books, and The Doorways of Ireland, (Frances Lincoln). He lives in Waterford. Melissa Doran grew up in Leitrim and studied architecture and digital media technology before becoming an illustrator. Her favourite medium is digital collage that combines lots of hand drawn elements. She also teaches digital illustration and organises sketching mornings in Dublin. To see more of her work visit www.goradiate.ie.